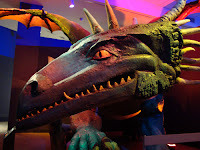 The Fernbank Museum of Natural History's newest exhibition, "Mythic Creatures: Dragons, Unicorns & Mermaids" is absolutely incredible, enchanting even. I arrived on opening day in the afternoon. The parking lot was full, but there were a number of folks who had been there a while and were leaving, so was able to relatively easily get parking. I noticed, even in the parking lot, the diverse nationalities who were interested in seeing Mythic Creatures, which translated inside as well. The visitors' cultural and national diversity was as well represented as the origins of the many mythical creatures, from all over the globe, in the exhibition…an encouraging sign. Getting in and obtaining a ticket was as easy as usual…no wait, very nice. The ticket-taking volunteers provided a brochure with a listing of Opening Day Celebration events, which I didn't even know about, but enjoyed immensely. 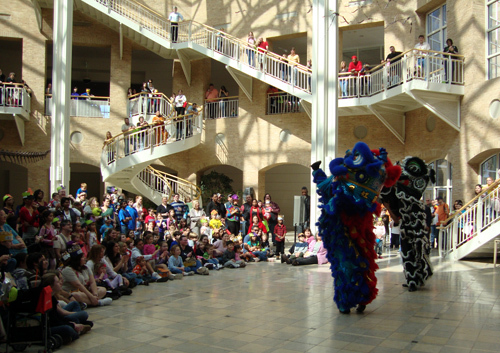 I walked into the Great Hall just in time for the start of a Chinese Lion Dance by the Chien Hong School of Kung Fu, believed to bring luck and fortune to all those who see it (I should have played the lottery that night!). 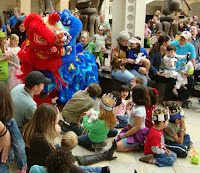 If you've not been to an Opening Day Celebration at Fernbank, and to encourage you to attend the next one, some of the events that day were a Kidsville News Guest Appearance by Truman, the green dragon mascot from Kidsville News. There were also stations for (mythic-themed) temporary tattoos, a game and coloring corner, a Griffin hat craft station, B98.5 games and giveaway, and storytelling sponsored by Medieval Times Dinner & Tournament. 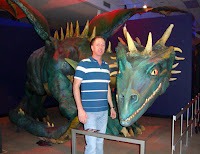 After the Chinese Lion Dance and a quick salad in the Fernbank Café, I ventured into the Mythic Creatures exhibition. "living and prehistoric animals inspired dragons, unicorns, mermaids and more as you learn how cultures throughout time have created legends of mythic creatures to explain the natural world." Fernbank has created an exhibit that tells the tales behind many mythical creatures from around the world that roam(ed) the earth, air, and water…creatures that have given hope, that have terrified, that have inspired dreams of what may be. 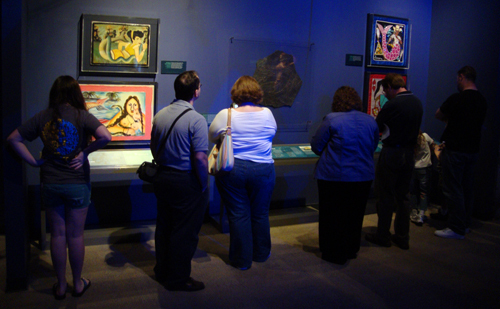 This exhibit is an experience of imagining, learning, and contemplating. Walking into the exhibit you see a placard, adorned with gargoyles, telling you what to expect, but it doesn't quite set you up for the wonders awaiting you inside. Rounding the corner entering the exhibition, the first creature you meet is a "life-size" dragon. 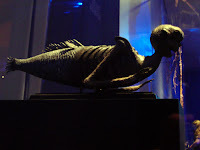 The winged-beast's head is close to the floor (an excellent photo opportunity), but is big enough that he/she could easily fit a grown human in its mouth, were it carnivorous like some of its dinosaur neighbors instead of the fire-breathing sort of creature its more commonly known as. While there at the big dragon I met Cooper and his daughters who a friend and I had just seen at the bowling alley where we were practicing. He and his girls were participating in a daddy/daughter outing. The girls were really excited to have their photo made with the dragon. Atlanta is the smallest big city I've ever known! The total exhibit contains relics, artifacts, works of art, and models of various mediums including sculpture, paintings, model animal parts, fossils, costumes, photographs, glass art, masks, statues, pottery, books, carvings, and videos. Suffice it to say that you're going to need ample time to fully explore the marvels of this exhibition. After the dragon, the next largest "specimen" I encountered was the Kraken. Being a sea creature, its head and multiple tentacles are protruding through the (sea) floor. The tentacles are considerably taller than I am at 6'2"…an impressive red-eyed monster, to say the least. Mixed between the upcoming Unicorns and Dragons are a multitude of other mythical creatures each coupled with placards explaining the cultures that told, or tell, their stories, as well as the evolution of some of them. 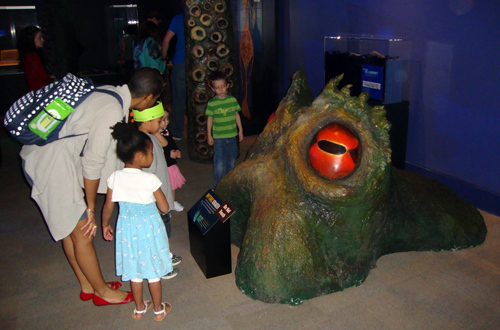 Among the creatures in the exhibit are: the Cyclops (Greece), Nessie (Scotland), Yawkyawk (Australia), Ahuizotl (Aztec), Kappa (Japan), Sedna (Arctic), Big Foot (Canada), Barong Ket (Bali), Son of an Almas (Mongolia),and Chupacabra (Puerto Rico), to name only a few. 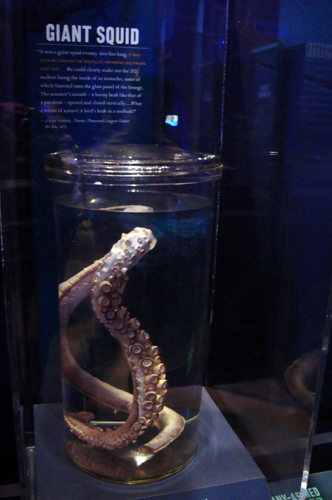 Coupled with several mythical creatures are real artifacts or specimens to help facilitate the truth about what people have seen, such as Jules Verne's Giant Squid from the book 20,000 Leagues Under the Sea. To explain what he wrote about there is a six-foot section of tentacle modeled from a 25-foot Giant Squid caught in New Zealand, now in the American Museum of Natural History in New York City. The Giant Squid, a real species, can grow up to 70 feet long…so Jules was not totally exaggerating. Another interesting point convey by the exhibit is that some mythical creatures were based on fossil remains. The Gigantopithecus, a huge ape-ish creature that went extinct about 300,000 years ago (so we don’t know if humans ever actually saw one), was a habitant of certain parts of Asia. The ancient Greeks created the Monster of Troy based on a fossil skull found protruding from a mountainside (believed). The skull is likely the remains of an ancestor of the modern giraffe, called Samotherium. Cultures' histories around the world are peppered with stories similar to this (and there are a lot more examples in the exhibit). Another method of perpetuation of the existence of mythic creatures has been commerce or entrepreneurial…or to be more accurate, false advertising. For example, northern merchants sold the tusks of a small arctic whale called narwhal claiming them to be Unicorn horns that held magical powers. They actually look very much like a Unicorn horn. 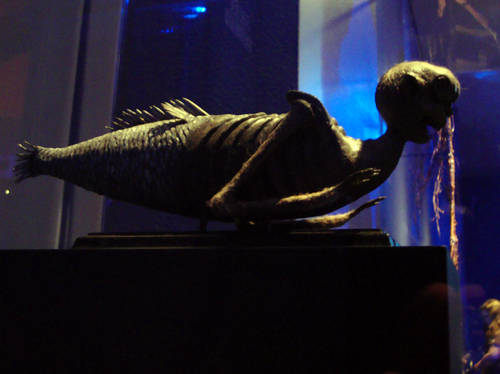 Another example is the Feejee Mermaid, called such for a hoax masterminded by P.T. Barnum (the famous circus showman), which is a "manufactured" mermaid created by sewing the head and torso of a monkey to the body of a fish…a practice more than 400 years old. From personal experience, I recall living in Wyoming as a teenager, never having been out West and still relatively gullible, being shown and told stories about the "Jackalope," a cross between a Jack Rabbit and an Antelope, and shown specimens of the anomalous creature. It took only moments to reconcile the impossibility of such a creature (but weirder things do exist, right? ), but the folklore of the Jackalope remains alive and well. As I would learn during my time in Wyoming, westerners love their practical jokes…which actually are lots of fun! 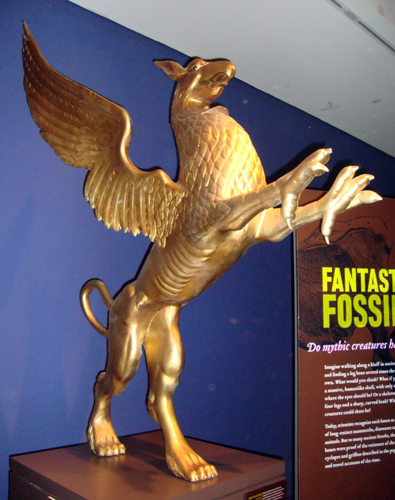 The Griffin, a personal favorite among mythical creatures, is represented in the exhibit…a tall golden one perched on hind legs, at that. A guard of gold, this particular model is actually gold in color…a remarkable representation. 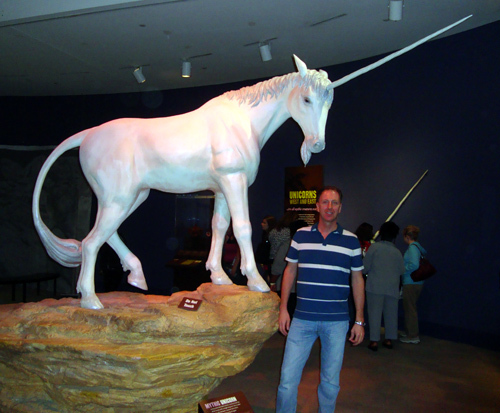 A very, very popular photo spot in the exhibition is in front of the life-size Unicorn, a white horse with a single long horn growing from its forehead. 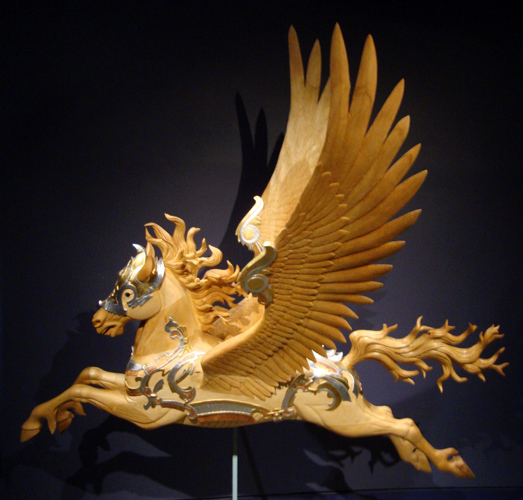 The exhibit tells us that the Unicorn is a creature that exists in the history of many cultures, including the qilin, a Unicorn from China. Even though there were mostly younger persons taking advantage of the opportunity to be photographed with a Unicorn, I myself couldn't resist…I mean, when is this opportunity going to present itself again? There is much, much more to see in this exhibition, but I've taken enough of your time. 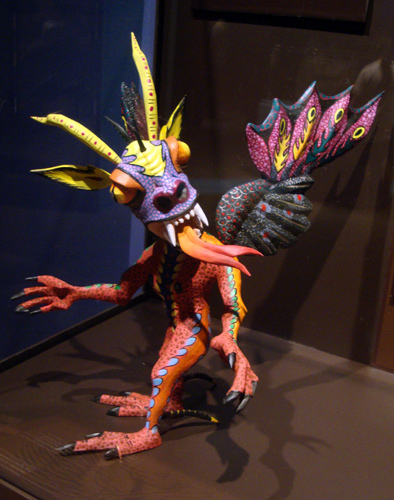 Go see the exhibition for yourself and be taken on a mythical adventure of epic proportions! I'd like to applaud Fernbank Museum of Natural History for allowing photographs in this exhibit. They've made a lot of kids happy, adults too, by giving us special memories that we can revisit, and share, anytime we wish just by clicking through a photo album…thank you, Fernbank! 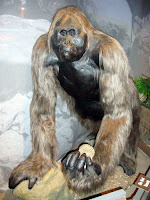 The much-anticipated Fernbank NaturQuest exhibit is opening soon (Saturday, March 19, 2011). Created for kids, the exhibit will be a highly interactive fun and learning environment complete with a clubhouse, a tree fort or sorts, and state-of-the-art technology to engage kids in learning in several unique ways. And, for grownups, there is the Martinis & IMAX event on Friday evenings, which I'll be attending this coming Friday to catch up friends I knew in Washington, D.C. who live in Atlanta now…looking forward to meeting up with them in such an ultra-cool space. There's a lot more to see at Fernbank. Some of the attractions that I like to revisit from time to time are the Star Gallery, Fernbank Forest, the rose garden, Reflections of Culture, World of Shells, and of course the dinosaurs! There's always something new at Fernbank whether a new special exhibit, a new IMAX film, or a fun exhibit-related event. 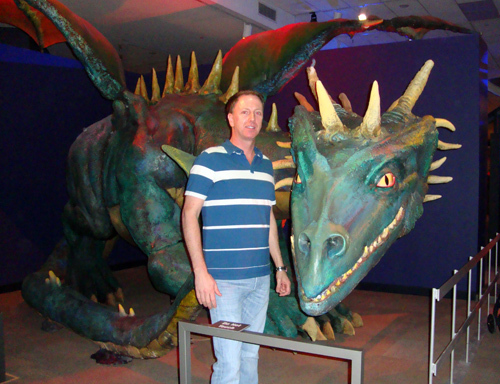 See an exhibit at Fernbank more than once? I totally want to go back and mingle with the dozens of mythical creatures at Fernbank, learn more about the similarities and differences among cultures when it comes to explaining the world we live in. So, yes, I will definitely go back to see "Mythic Creatures: Dragons, Unicorns & Mermaids."